The eight panel arrangement, using GEZE’s Manual Sliding Wall (MSW) with SmartGuide system and Pureline cover profile, is a seamless space divider with no metal surrounds, which separates the two sales areas while maintaining an open feel. The MSW was the ideal choice for Glassedge, which was commissioned to install the feature at Bentley Sytner, in the city centre. Fitted with 12 mm clear, low iron toughened glass which minimises sun reflection and so allows as much light in to the showroom as possible, the installation also features GEZE’s Pureline, a silver anodised profile with a modern angled design. Each panel discretely locks into the next one via a floor locking device, which is completely hidden from view. Above, the recessed roller track further enhances the sleek appearance whilst the SmartGuide system enhances its functionality. The manual sliding wall (MSW) also incorporates a swing door with a polished stainless steel handle – making the two areas of the showroom accessible to customers and staff – without interrupting the fluidity of the glazing. In total, the wall spans seven metres in width and 3 metres in height. The MSW system is easy to handle - when the wall is not needed, the panels can be pulled back, into a parking space where they sit at a 90-degree angle – a real space saver which minimizes impact upon the room, or as at Bentley Sytner they are completely hidden away inside a wall cupboard. 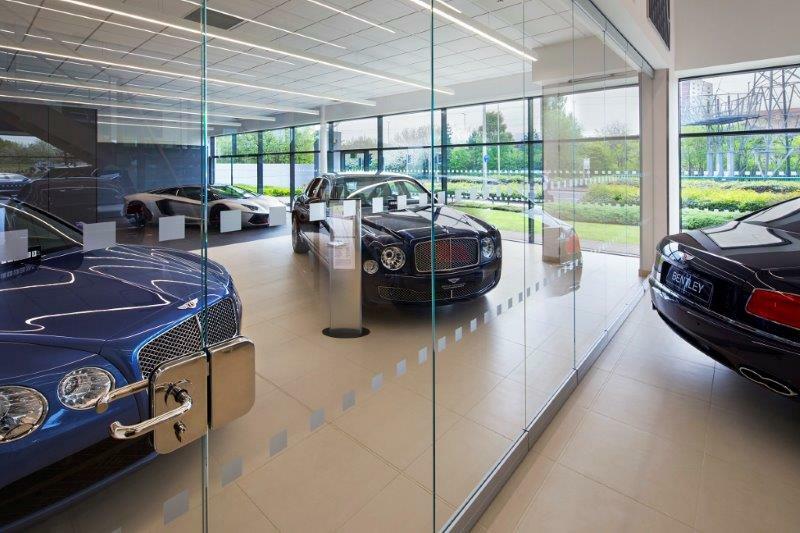 The overall effect is a contemporary stylish finish which benefits from the light and airy feel needed for a showroom in which the cars themselves can take centre stage. “Our MSW system presents a fantastic solution for retailers who want to use their space creatively. They can be used to open out or separate areas in shops, cafes, offices and hotels as well as prestigious car showrooms. We are delighted that Glassedge chose the MSW with Pureline profile in delivering its requirements for the Sytner showroom where the quality of Bentley and Lamborghini vehicles can be seen in all their glory and benefit from the flow of natural light. “It was very easy to install and when in place, the effort required to move the individual panels was minimal.